If you could have any superpower, which one would it be? You can now be just a little closer to having it with these superhero costumes. You might not develop Hulk's incredible strength or fly like Superman, but we guarantee that laughter and fun will be your new abilities…the greatest superpowers of all! 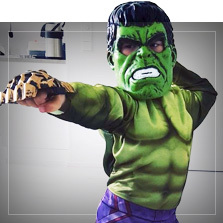 In our online catalog, you will find a wide selection of superhero and villain costumes so you can become your favorite movie or comics character. Jump into a Superman or Wonder Woman costume, wear the Joker's purple suit or channel his crazy girlfriend with some colorful hair and a Harley Quinn costume. Maybe you’d like a night out in town in a Batman costume, or maybe even a Catwoman costume? 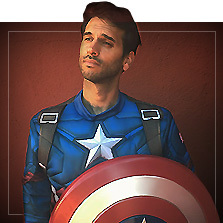 And if you're more of a Marvel fan, how about a Captain America costume? We have the perfect Spiderman, Deadpool and Thor costumes, so you can feel like a god for a day. 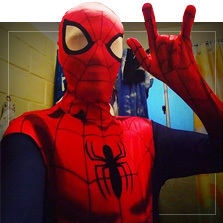 Whatever your favorite theme is, get inspired by our huge collection of comic and superhero costumes. You can also get your friends together and fight the villains that threaten your city with Ninja Turtle or Power Ranger costumes. We have the most amazing superhero costumes for the whole family: men, women, boys and girls…and even pets! Besides these incredible costumes, you’ll also find the best Marvel and DC Comics merchandise, gifts and birthday decorations. From the most popular ones, like Batman or Captain America to the more latest ones like the extravagant members of Suicide Squad or Guardians of the Galaxy. 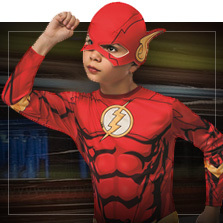 We offer one of the biggest and best selections of male, female and kids superheroes costumes. Our collection features officially licensed products - replicas of the outfits seen and worn by superheros in the movies. Despite the fact that these characters were created on pencil and paper, it wasn't until they appeared on the big screen until they became famous, even though over the years comic books have always been trendy. Imagine organising a superhero themed birthday party for your little one? Would they be more of a Spiderman or Superman fan? or perhaps they lean more towards Wonder Woman or that peculiar villain Harley Quinn. A good superhero costume might even come in handy for the end of the year school play, who knows. Buy your superhero costumes online stress free at the best price and next day delivery guaranteed!! Not even Flash himself could do it as fast. If you want to team up as a dynamic duo you don't need superpowers to match your favourite hero to their super-sidekicks, we’ve got super costumes for partners both male and female in our wide collection of superhero costumes. As well as elite collector's edition costumes we’ve got fantastic money saving options. As well as elite collector's edition costumes, we’ve got fantastic money saving options. 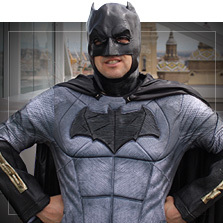 Why not take a look at our Batman and Robin costumes? As they say love doesn’t have an age limit, well either does dressing up! Admit it, you’re not here for your child..You’re here for yourself. 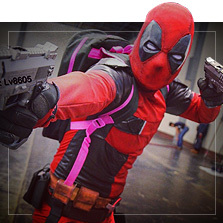 Stag parties, Hen parties, Halloween or any themed fancy dress party- you couldn't choose anything better than Superhero Costumes. Why not bring out the superhero in you with these epic superhero costumes, it’s about time you did. We have great deals whether you're buying in groups or just two’s or even for dogs! If you’ve always wanted to have wolf claws or feel powerful and frivolous like Iron man or you need to let that hulk inside you out then this is the place for you. Maybe you’re tired of being the good guy all the time. Don’t worry , we have a solution. Not only do we like you the same but we get you. The bad side can be very luring. Anyway, in the end, all villains deep down have a warm heart but it's their dark past that haunts them that leads them to doing evil. Choose your favourite “bad” guy and get yourself one of our Villain costumes. Cross that thin line between the good and the bad and be one of THEM for a change, Joker, Voldemort, Harley Quinn, Lex Luthor, Loki or the evil Rita Repulsa, Power Rangers number one archenemy. Are you familiar with the term cosplay? 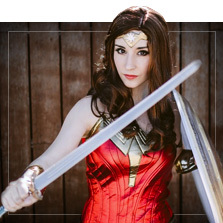 Whether you simply just know what it means, whether you cosplay yourself or you are completely unaware of the term, you are in the right place because, one thing we know is that it’s about costumes. Cosplay, abbreviated from Costume play , is a performance art in which people dress up to represent a certain character. Cosplay isn’t just dressing up it’s more like bringing characters to real life, it has become a culture, way of life and cosplayers are a common feature of fan events, movie premieres among other public events. 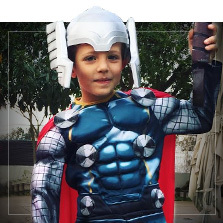 Superhero costumes is our speciality- with high-end outfits and officially licensed products available to meet the high demand. Continuing with the cosplay idea, although the outfit itself is the most important part of it, it’s not the ONLY part of the look as we’ve got makeup and accessories to complete it. It’s the small detail that makes up a perfect outfit. 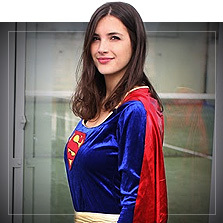 Here you’ll find a Superhero Costume to be able to turn into your alter-ego, the only extras you need are passion and personality. In any case, if you’d prefer to create your own costume to make it more personal, you can do this with our collection of kits with masks and capes. Not even your dog bestie will miss out thanks to our super collection of superhero dog costumes. Who do you prefer the most?? Marvel or DC? If you’re in any way familiar with these two, you’ll know that since the beginning of time around the 1930’s these were the two big time comic editors, and were brought into the film industry years later, one through Warner and the other through Disney. Similar to the “ Who came first? the egg or the chicken?” we now ask- Who is better Marvel or DC? It’s not an easy one.It’s like saying who’s your favourite, mam or dad?? Coincidentally they both came to life in the united States right after the stock market crash in 1929, leaving the country drowning in misery-perfect timing for two superheros to make an appearance and save the Americans from the great depression, at least in the fiction world. They didn’t just have one but two superheros- Superman (DC) and Captain America (Marvel). They came to light to entertain evade and even give a positive energy kick to the people. Both Marvel and DC’s approaches have their pros and cons. The Marvel Cinematic Universe populated by the Avengers (a team of superheroes that includes Captain America and the Hulk) is filled with stories crossing from the big screen to the small, which makes it a lot of fun to get involved. Although, DC wins by a landslide in terms of number of characters with a whopping 20,000 heros and villains to a mere 7,000 by Marvel. Marvel has many more valuable franchises currently but they lack the unified structure of DC so it's harder for them to explore their universe cinematically, with franchises divided over several studios, but even DC had to separate Arrow and Flash from Supergirl. If it’s anything that differentiates Marvel from DC it’s their ability to connect with their fans and audiences. In fact, they’ve all sorts of people appearing in their comics- black race, homosexuals. No matter what side you're on we’ve got costumes that’ll suit you and your needs. In our wide collection of Superhero Costumes you’ll Superman and Spiderman, Batman and Iron Man, Flash and Lobezno and various models of Captain America costumes. It’s true that when we think of Superheroes the first thing that springs to mind is a cape and flying. Not all Superheroes have the same superpowers nor were they created by Marvel and DC. It was in 1993 when Power Rangers made its first appearance on TV. A group of young teenagers, with an attitude and superpowers who were chosen by the wise Sage Zordon to become Power Rangers in order to put an end to all evil. When they go into battle, they become metamorphosed into battle suits and are then differentiated by the abilities of each one, as well as by the colours of their attire. You’ll find all of the Power Rangers costumes in our wide collection : Power Ranger- Red, Pink, Black, Blue, Yellow and Green. While we’re on this topic, we can talk about the famous Ninja Turtles a similar style of Superheroes. There were 4 teenage brothers, half human half reptile. They were each named after Famous Italian Renaissance artists and live in the sewers with their adopted rat father. They are, of course, able to speak and well able to fight. Their existence is due to a failed experiment. The origin of these characters actually dates back to 1984 from a black and white american comic book. They became well known a few years after when the first series was broadcasted on TV. As well as fighting off the bad, Leonardo, Donatello, Raphael and Michelangelo eat pizza when they can. Just like the Power Rangers, the Ninja Turtles define themselves by different colours, in this case, by their eye mask. Blue for Leonardo, Purple for Donatello, red for Raphael and orange for Michelangelo. You’ll find all the colours of all Ninja Turtles costumes in our wide collection online.